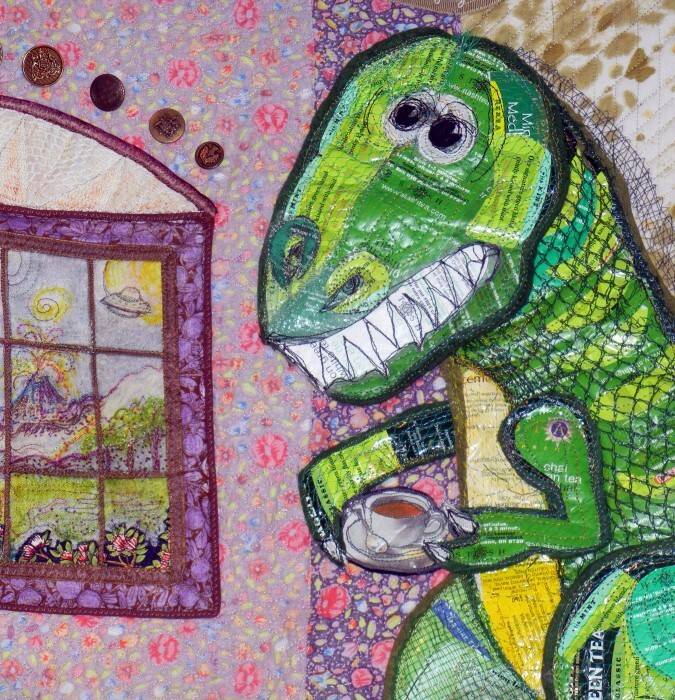 Word play is often a part of my art quilting, so my riff on T-Rex shouldn’t come as a surprise. And like other pieces in my ReUse, trash-stash series, this piece is made of tea bag envelopes, coffee bags, and other foil-lined packaging. And yeah, it’s a “green quilt,” as in the term coined by Susan “Lucky” Shie, representing an effort to use what’s on hand and upcycle, to do our part for the planet. Of course, the citrus net bags, vintage fabrics and trims, buttons, beads, and rickrack are here partly because, as my hubby bemoans, I never throw anything away. 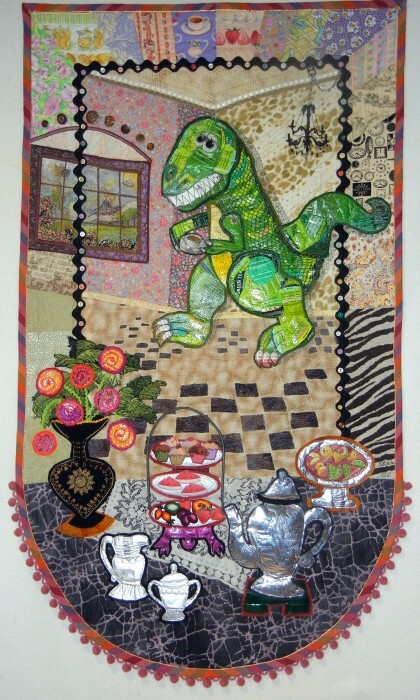 Yes, I began with an appealing pun, a Barney-like dino and an Alice-in-Wonderland tea party set up, with a funky vase made from my grandmother’s well-worn, embroidered neck wrap, and the vase is filled with—what else?—tea roses. Here’s where the word play wandered into sword play, quickly and quilterly lunging into the more politicized rooms of my mind. Didja notice the space ship and volcano out that window? How about the tsunami rushing in, the blazing sun, the meteor hurtling towards earth? It seems our titan of leisure is cluelessly indulging in conspicuous consumption. Our Tea-Rex is denying inconvenient truths, such as global warming and waning resources for those lower on the food chain. Instead, the arriving guest invents wild fabrications…and invites extinction. A cautionary tale? A parable for our time? Obviously, this Tea-Partier is way out of date. This entry was posted on Saturday, March 28th, 2015 at 6:23 pm	and is filed under Art + Quilt, Inspiration, Personally Speaking, Recycled Art, Unusual Materials. You can follow any responses to this entry through the RSS 2.0 feed. You can leave a response, or trackback from your own site. Everything about this is utterly great. 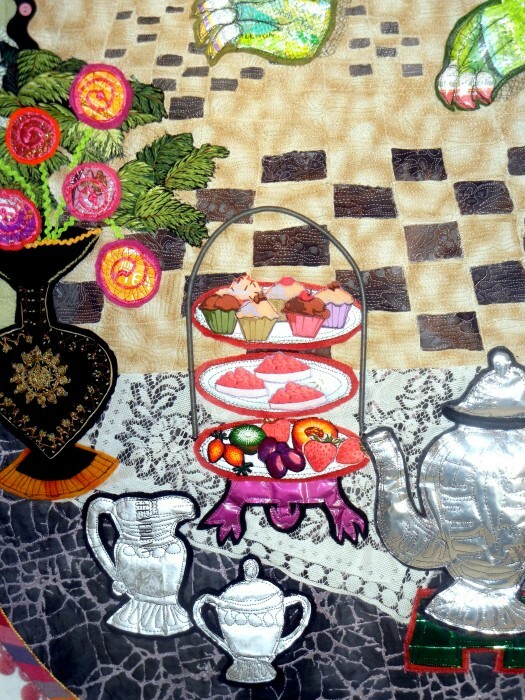 oooo, I just noticed the stuffed metallic teapot! Is that a coffee bag? Yup, it’s a coffee bag–the inside. Creamer and sugar bowl are swirly designs on Starbucks coffee bags a friend gave me. None are stuffed, but sewn to felt, with lots of free motion designs, then sewn onto quilt, but just around the edges. 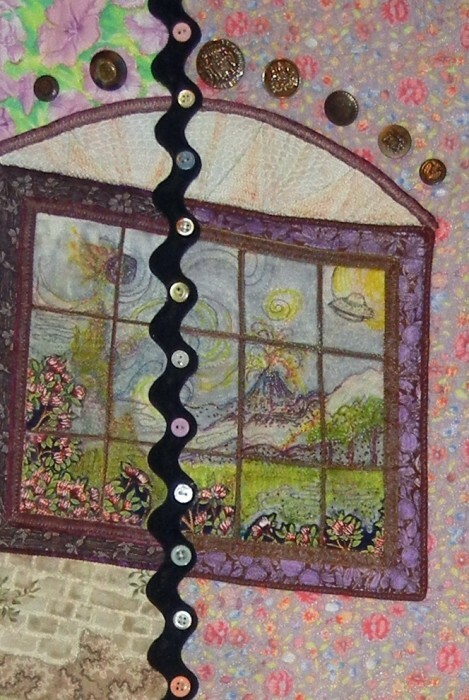 I love the whimsy and imagination that have gone into this quilt. Many details – making it so much fun to look at! Thanks, Julie! But so much time went into it, it is not fun for me to look at…right now. Fortunately, I don’t have to: it’s on view at a gallery.